This is my Quick Step Veresque laminate review based on me installing it in a home. As usual Quick Step laminate is a pleasure to work with. This particular brand of Quick Step has a slight hand hewn texture on the surface. All four edges are beveled. The color I installed is called Warm Apricot Cherry, as you can see in the photo below. This is a darker color which has variation in color. A medium brown with not much woodgrain. It has a more rustic look. Medium brown with a lot of variation in the woodgrain. A medium brown with not much variation in color. Shows a lot of grain with some variation in color. It is also Known as Brazilian Cherry. Real Jatoba wood grows in southern Mexico through Central America down to northern South America and also in the West Indies. A lighter golden brown with a soft woodgrain pattern. This is a medium brown and has a wider soft woodgrain. The cost is around 3.00 per square foot. In some cases if you order a large amount you can get the cost per foot reduced. If ordering online pay attention to the shipping cost. I noticed on Bestlaminate.net as of March 2012 they have a flat 97.00 shipping fee. The width of the planks are not as wide as most laminate floors. The Veresque measures 4-7/8 by 47-1/4. The thickness is 8mm with a AC rating of 3. It carries a limited lifetime warranty also. The cost of this laminate is a little high, but the quality is good. My client ordered it online from Bestlaminate.net. She said their service was excellent. I installed this laminate in a living room, dining room and bedroom. I had to remove the ceramic tile in the entry way. The tile was kind of out dated and way too big for an entry, 6 X 6 feet. This laminate was easy to install mainly because of the Uniclic locking system. This locking system allows the planks to be tapped together while laying flat side by side. This really makes it easier when installing under door jambs. 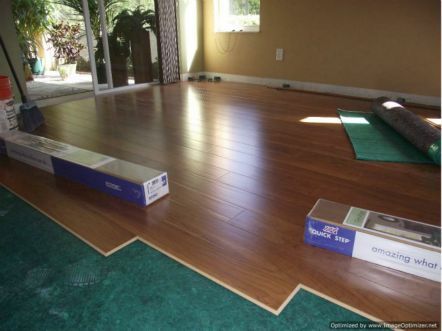 Overall I would recommend this laminate flooring. Its high quality and always easier to install than a lot of other brands. The cost is a little high for an 8mm, but comes with less problems than some of the off brands that have different locking systems.